Sai Yok National Park covers 958 square kilometres of wilderness stretching all the way to the Burma border. While most of it is inaccessible, you will find some waterfalls cascading into the River Khwae Noi near a campground and bungalows that make for a relaxing stop on the way up to Thong Pha Phum and Sangkhlaburi. The main attractions are Sai Yok Yai (aka Khao Chon) and Sai Yok Lek waterfalls, both plummeting eight to 10 metres into the clean river. At the easy-to-reach Sai Yok Yai, a suspension footbridge leads across the river to a viewing area near several floating restaurants. You’ll need to pay a longtail boat driver 300 baht to take you the half-kilometre downriver to Sai Yok Lek, oddly the larger of the two (lek means "small" while yai means "big"). A kilometre-long trail near Sai Yok Yai makes for a pleasant nature walk. The park also oversees Tham Lawa, a cave located further south off Route 323 and accessible only by boat from Pak Saeng Pier. Said to be one of the most dazzling caverns in a province that’s studded with them, it includes several massive rooms with no shortage of stalagmites and stalactites. While we wouldn’t dissuade anyone from visiting Sai Yok National Park, we find the entrance fee that doubled to 400 baht for foreign adults in 2015 to be a little ridiculous considering there’s not all that much to see here. 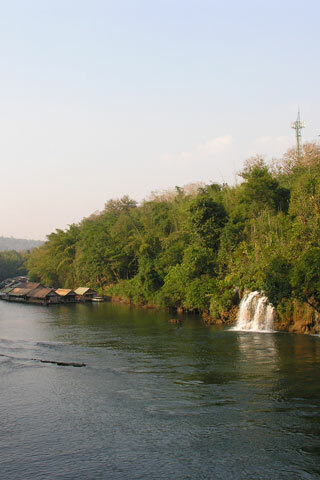 The entrance to Sai Yok National Park is located right off Route 323, some 95 kilometres northwest of Kanchanaburi town and signs are well signposted if you're coming on your own. Buses to Thong Pha Phum or Sangkhlaburi can drop you along the main road, from where it's a km walk to the car park and another half kilometre to the waterfall.